Remember when I said the book was done and locked? A couple of weeks ago Viking surprised me with a second set of page proofs to review, to make sure the changes I made to the first proofs went through OK. So I marked those proofs up too and sent them back. I forgot that finishing a book has a bit of a Zeno’s paradox feeling about it: the book is the arrow that can never reach its target. But I think now it really is done. Or at least it’s asymptotically approaching done-ness. It’s even getting reviewed, though so far only in what we call “the trades,” meaning book-industry magazines like Publishers Weekly that cover books a couple of months before they come out. The feeling is unnerving—The Magician’s Land still seems like an intimate part of me that I can’t believe people are actually looking at. Reviews so far have been really great, which makes me happy. But still. Meanwhile it’s time to get the promotional apparatus up and shambling. 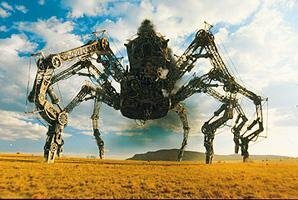 (For some reason I picture it looking something like the giant steampunk spider in Wild zithromax generic brand Wild West.) A lot of people kind of lament the promotional part of being a novelist, but I don’t really mind it. I’ve got a product to sell, I’m not going to pretend it’s special just because it happens to be a novel. I’m not very good at selling it. But I don’t mind trying. Most of the time I actually enjoy it. So my summer’s filling up with events, most of which haven’t been announced yet, and I’m probably not supposed to announce them here, so I won’t. But I’ll be popping up all over the place and then touring properly in August. For now I’ll just mention something that’s happening at Rutgers on May 1 that involves Catherynne Valente, so you know it’s going to be quality. And on May 31 I’ll do a public conversation with Deborah Harkness in New York as part of BookCon. Again: quality. And if you’re anywhere near Brooklyn, scrawl August 5th on your calendar. That’s the official pub date of The Magician’s Land, and I’m planning an event that night that should be be a bit special. I suggest bringing up that you mention a Jefferies tube in there. You know that sold me instantly. I am so excited for this book! 🙂 Really happy to hear it’s getting good reviews. Dang, I was hoping that “I’m probably not supposed to announce them here” was a misdirection and went straight to the Events tab. Sadly, it only shows two lonely outdated events from 2013. Sigh. I will try to be patient. The events page truly is a ghost town. We’re rebuilding the site in a couple of months — that’ll be the first to go. It figures that August 5th would be one of the most solemn days of the Hebrew calendar. Will the audio book come out the same day? Make sure to get yourself down to DC. Politics and Prose is wonderful that time of year (or any time of year). The weather not so much, but what can you do?